Every month a member of the Carus team introduces his/her favorite work, whether it be a choral piece, a CD, a songbook or an instrumental work. The recommendation for September 2017 was contributed by Sarah Schweiger. It was not an easy task for me to choose a single favorite piece. Starting with beautiful organ music by Max Reger or Louis Vierne, through choral works by Bach and CD recordings too, the Carus-Verlag catalog contains many fantastic works. 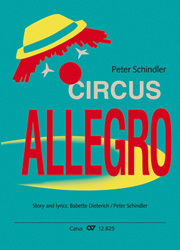 But what emerged as my favorite piece after some consideration is the children's musical Zirkus Furioso (Circus Allegro). As a big fan of musicals, the ones I know are those which are, or have been, on Broadway. So it was a pleasant surprise for me to experience children's musicals too, which appeal to me a great deal and contain messages not only for chidren. 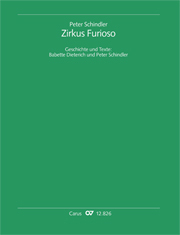 I have followed Peter Schindler, composer of Zirkus Furioso, and his works since I began working at Carus-Verlag. So I was able to experience at first hand how he works on his pieces with a choir at the Choratelier in 2016. It was really interesting to experience his enthusiasm for this aspect of his work and his passion for music in general as a participant in the workshop. I was able to develop a much more intense connection with the piece. My favorite piece by him is Zirkus Furioso. In this musical we live through an eventful, but (because of that) very amusing afternoon with the circus director Leo Pimpelmoser. At first the director's assistant disappears, then also the tiger, the bear is bitten by a mouse and will no longer appear, the fakir Fanfalo almost misses his entrance by oversleeping, but the combined energies of all the circus artists nevertheless make this a very successful performance. Through the musical's expressive writing listeners are involved in all these events right from the very beginning. Lots of dance rhythms ensure that the audience is immersed in the circus atmosphere. The elephant Chico dances a rumba in front of the audience, the bear (who is also persuaded to do this with lots of pots of honey) still appears at the end and performs his circus tricks in swing rhythm to the best of his ability, and the circus horses make an appearance in a gallop-march we can sway to. We even see the dainty Graziosa glide effortlessly over the stage with a light, floating melody. But what particularly appeals to me is the fact that the individual circus artists are perfectly portrayed through the different melodies and rhythms, and as a member of the audience, you really feel you are in the middle of events. So the sizzling of Signor Vulcano's fire is perfectly accompanied by the percussion, and the clip clop of hooves by the galloping circus horses is imitated with cymbals and a short, rapid rhythm. The melodies have been written so that after a couple of verses you can actually join in singing with the performing children, and thus become a part of the piece yourself. You most definitely go home with a lighter, happier heart and beautiful memories. Sarah Schweiger studied book science and history at the Friedrich-Alexander-Universität in Erlangen. In her free time she plays the organ and is a keen choral singer. She has worked at Carus-Verlag since October 2016, since February 2017 in the Sales Department.